Richard Gonzales: the real record shows his greatness. Is Roger Federer the greatest player of all time, or is it Rafael Nadal ,or was it really Pete Sampras? Or Rod Laver? Or someone else? The argument will continue indefinitely. But an unbiased examination of the actual history of the game shows that player was Richard Gonzales. What are the criteria for determining historical greatness? Most pundits start with Slam titles. Whenever the name of Richard "Pancho" Gonzales comes up in that discussion, he is dismissed because he only won two, the US Nationals in 1948 and 1949. In some polls, Gonzales doesn�t even make the twenty greatest of all time. Jack Kramer, who had an agenda regarding his own greatness, said this about Gonzales�s history: "You look up the records, they don�t show anything." But the quality of pre-open tennis is completely misunderstood and therefore the validity of the Slam criteria. Why? Because of the vast difference in levels between the amateurs who played the Slams and the pros who could not. 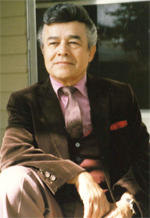 David Hernandez, PhD, is a musician, a poet, a writer, a teacher and a tennis player, who happens to have been born in 1928, the same year as Richard Gonzales. He is the author of 10 books, including Hispanic Profiles of Great Figures Little Known in America, and The Greatest Story Ever Forged: The Curse of the Christ Myth. The genesis of this article was a meeting, arranged through a mutual friend, with Greg Gonzales, nephew of Richard, the greatest player in tennis history. David lives in Carrolton, Texas. Hispanic Profiles is an extraordinary contribution to both English and Spanish speaking culture that discusses in a single volume the vast number of Hispanic figures prominent in the history of the world culture, yet little known or unknown in America. The Greatest Story Every Forged: The Curse of the Christ Myth What are the origins of the religious wars throughout history, including the Islamic and Christian wars of today? The Greatest Story Ever Forged discusses the fabrications giving birth to the monotheistic religions, their early development, and how they have tyrannized the West and Middle East for these many centuries.